George Lucas has two credits on Strange Magic: Executive Producer and Story. In Hollywood, having a screenwriting credit often means very little, and a story credit usually credit means even less than that. By any reasonable standards it would be completely unfair of me to single out someone with a story credit when critiquing a film. That being said, it’s difficult to look at this movie without seeing the fingerprints of Mr. Lucas on it, and comparing Strange Magic to Lucas’ large and well-known body of work is a much more interesting conversation than trying to suss out patterns from director Gary Rydstrom’s pair of Pixar shorts. So please understand that while I will be discussing how Strange Magic fits into the larger body of George Lucas’ career, I do so with the realization that the quality of the film rests on the shoulders of more than just Mr. Lucas. 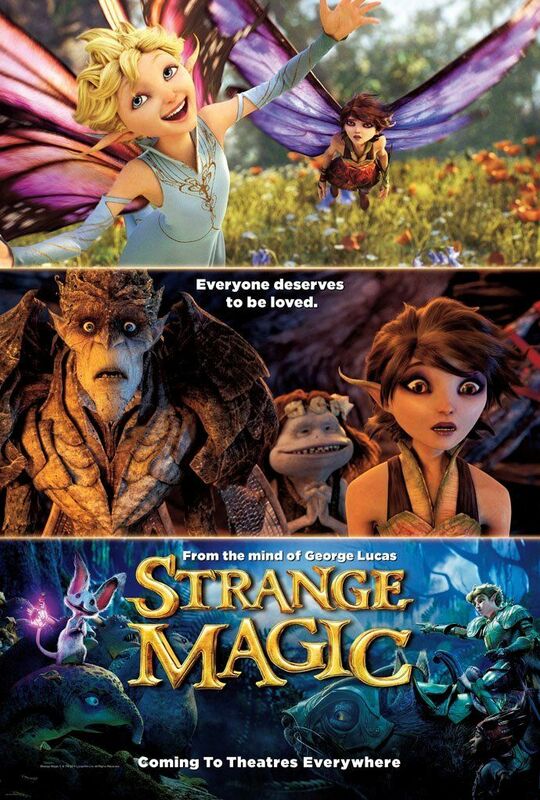 With that disclaimer out of the way, let’s talk about Strange Magic. Imagine you have a kid, and they decide to surprise you by cooking dinner, so they take a bunch of things they know you like – some pasta, some breakfast cereal, some hot sauce, perhaps some left over steak, and some candy – and they mix it all together in a big pot and put it on the stove. In the end, they’ve made little more than a distasteful mess, and yet they genuinely tried to do something good and worked so hard at it that it’s hard to get mad at them for it. Strange Magic is a fairytale jukebox operetta* that tells the story of two lands separated by a border made of primroses. There’s the Fairy Kingdom, inhabited by free-spirited fairies and elves, alongside the Dark Forest, inhabited by trolls and goblins and various manner of insects. The primroses along the border of these two kingdoms were once used to make love potions, but many years ago, the Bog King of the Dark Forest kidnapped the Sugar Plum Fairy and had his minions chop down all of the primroses to ensure that no more love potions could ever be made. In the present, Marianne, the princess of Fairy Kingdom is preparing for her marriage to the handsome Roland. It turns out, though, that Roland is only planning to marry Marianne in order to gain power over the Fairy Kingdom, and when Marianne accidentally discovers that Roland is cheating on her with another fairy, she calls the whole thing off. In response, Roland convinces a lovesick elf named Sunny to sneak into the Dark Forest to get a love potion from the Sugar Plum Fairy, but when the plan goes awry it leads to conflict between the two kingdoms. What is perhaps most interesting about Strange Magic is how it shows off Lucas’ penchant for world building. The enormity of Star Wars is legendary, but even as far back as American Graffiti Lucas showed a talent for creating worlds which felt “lived in.” The world of Modesto, California might not be as large in scope as a galaxy far, far away, but in the few hours we spend there it feels real and alive. Yes, Modesto is a real place, and yes, Lucas’ story integrates a lot of real experiences, but that doesn’t make what American Graffiti does any less spectacular. It builds its world so strongly and so vividly that it manages to create feelings of nostalgia for a time and place most modern viewers couldn’t have possibly experienced. The two fairytale kingdoms of Strange Magic also feel real. There’s a history to this world, and it’s easy to imagine stories taking place long before the events of this film and long after. The issue, though, is that unlike the organic world building of Star Wars or American Graffiti, Strange Magic is so front-loaded with setting up the world of the story that it takes nearly half the movie to get to the central conflict. It spends so long moving pieces around the board in order to set up the action for the rest of the film that it becomes almost comical. There was a moment where things finally started ramping up and I briefly thought that we were approaching the climax, but I checked my watch and realized that it was merely the inciting incident, a full 45 minutes into the film. Then, there’s the issue of character. One of the great strengths of musicals is their ability to convey the deep, inner thoughts of characters in a short song. It allows characters to say out loud exactly what they are thinking and how they are feeling in a way that doesn’t feel lazy and forced the way it would if these things were vocalized as dialogue. Unfortunately Strange Magic is unable to use its many, many songs to effectively achieve any level of honest characterization for its players. Part of the problem, I think, is song selection. I’m a big fan of Moulin Rouge, another jukebox musical (though, as I’ve mentioned, Strange Magic is more operetta than musical), but while the songs in that film were expertly chosen and reworked to fit the purposes of the story, Strange Magic sometimes feels as if its story was reverse engineered from a playlist on Lucas’ phone. Many of the song choices feel poorly thought out and based primarily on which songs were easiest to license (Marianne rebukes Roland at a ball by breaking into Kelly Clarkson’s “Stronger”). It lacks thought and creativity, and ends up coming across as if the story was chosen to support the songs rather than the other way around. Also lacking in thought is the film’s noble, but misguided approach to making a film led by women. Lucas has said that he wanted to make Strange Magic a fairy tale for 12-year-old girls the same way Star Wars was a mythological adventure for 12-year-old boys, but in the process the film makes some really unfortunate statements. Also, note that I call these women beautiful within the context of the story, because the honest truth is that the character designs are nightmarish across the board in this film. It’s clear that the visuals in this movie were the result of a lot of money and a lot of hard work, and the lighting and textures are gorgeous, but the characters themselves are stuck in the deepest levels of the uncanny valley. Strange Magic is a very bad movie, but it’s certainly not for a lack of effort. It means well, even as it does just about everything wrong. That’s certainly not enough to garner a recommendation from me (do yourself a favor and don’t watch this movie), but it at least made the 100 minutes I spent with it more bearable than I expected. *Has such a thing ever existed before? I think this review of their relationships was very judgmental. The intent the author had in mind was, “one should look outside the boundaries set by society and find love for who a person is and not what they look like”. I thought that message was a great one, but it particularly one that will be rejected by most European Americans, as I’m sure they are repulsed by the thought of another race being their equal…. Edit: The Sugar Plum fairy was also POC-coded. So… two POC characters instead of just one. Cool beans.